Having spent 15 years working in education teaching 16+ I’ve seen my fair share of exam and assessment stress. However whilst some stress is motivational (it shows us that our exams matter to us) we can reduce the unnecessary stress by taking control early on and being prepared. For parents, the exam season can be just as difficult. You want the best for your children and the best opportunities. However keeping home life peaceful and planning opportunities for time out, as well as offering a quiet space where they can revise without distraction can make the whole home more peaceful. Spend some time getting your school/college/university notes in order. Having everything together means that you can get organised and have everything at arms reach. Collect subjects together and if you have any revision guides, text books or support notes group them with your notes. Speak with your teacher and identify the topics that you need to revise. Having a clear idea of which topics you need to revise means that you are well equipped and prepared. The better your preparation the more confident you will feel about your revision. Ask your teacher for any past papers that they have that you can use as part of your revision. If you have completed any past papers at school or have your mock papers make sure that you have some feedback so that you can use these to identify key areas you need to refresh or cover. Great now you can take time to create a revision timetable. 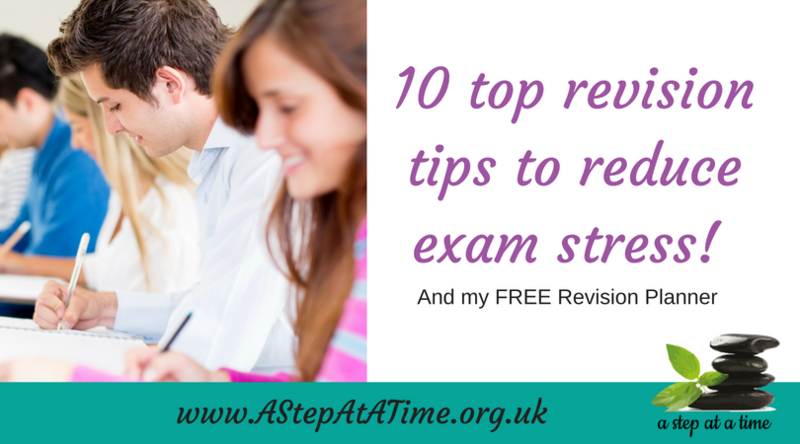 The more comprehensive your revision timetable the more focussed your revision can be. Taking time to create a timetable which covers all subjects and topics means that you know everything is covered well before the exam. You should aim to complete around 20 hours of revision a week, breaking this into 90min-2hour blocks so you cover 2-3 subjects a day. This means you could work for 3-5 hours a day Monday – Friday and take the weekends off revision and still be prepared. See note #6 before writing your plan. When you create your plan factor in all things that are necessary – include; breaks, meal times, fun things, exercise, commitments, study groups, days off. You can colour code subjects to make your plan more visual. Whilst it can feel like revising all the time will help it actually has the opposite affect. Our brain learns in patterns. By working in shorter spells and coming back to information so you need to recall it your brain strengthens the patterns. Recalling information a few times with breaks in between would allow you to learn faster than just staring at the notes for 6 hours. Working smarter rather than harder really does help revision! Therefore taking time OFF is important to allow the brain to rest then you can come back and recall the information later to consolidate it. For instance, revise one topic for an hour – take a break – then come back to it and see how much you recall and strengthen the gaps. Sleep allows our body to rest, refresh and restore itself. A lack of sleep can make us feel overwhelmed, stressed and anxious as our body feels under threat. Therefore ensuring that you stop revising at least 2 hours before bedtime and getting at least 8 hours sleep is a great way to ensure that your brain can revise more effectively and you feel in control. Whilst you are asleep your brain also consolidates the learning that you have done. The brain is able to process the new data and patterns and sort everything through, so when your parents say ‘it will feel better after a good nights sleep’ – they are right! Spending some time to work on your mindset is a really good way to prepare for exams and assessments. This means training your subconscious mind that you feel open and able to revise and learn. You can download my FREE Concentration for Learning Audio by clicking HERE and entering code EXAMS2018. The great thing about exams – we know when they will be finished. So once you have a clear revision planner and have started implementing it – then plan some fun activities to celebrate which will keep you motivated to stay on track. Rewarding yourself with something fun means you have a high and some well earned time out once the exams are finished.